Leave a comment below for a chance to win a “Try the World” Gift Box. One of the great pleasures of travel is discovering new foods and flavors from around the world. For any food enthusiast, finding new culinary delights is almost like making new friends because foods reveal so much about people, places and cultures. 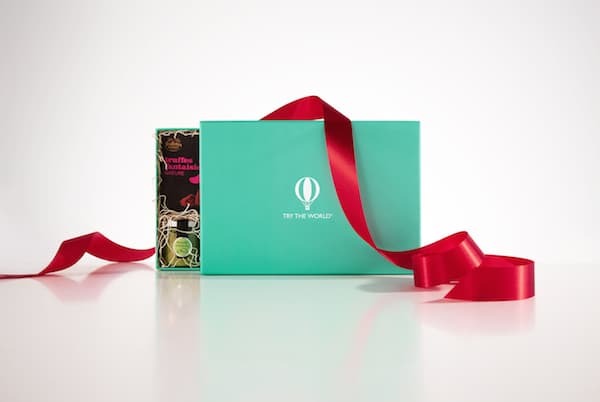 Try the World is a new subscription gift service that is perfect for the food lovers on your gift list who look forward to savoring new tastes—perhaps the relative who loves to try new restaurants; the friend who appreciates new ethnic dishes and ingredients; or the armchair traveler who is interested in lifelong learning about foods from around the globe. A subscription would also make a great birthday or holiday gift for a colleague, out-of-town friend, or son/daughter away at school. Every two months, the gift recipient will find a surprise box on his/her doorstep with a selection of artisanal food samples from a different county, the contents curated by a celebrity chef. For example, the foods on a given month may be from France, Spain, Brazil or Morocco. Congratulations to Mardy, the winner of the holiday box! This unique concept was created by Kat Vorotova, a New York foodie born in Russia and David Foult, a French globetrotter who both met while studying at Columbia University. Subscriptions start at $33 per box and include a culture guide, product card and music playlist. Shipping is free and subscribers can pause or cancel at any time. To find out more about the service, visit the company website. Try the World has agreed to send one reader of More Time To Travel a complimentary ‘Special Edition Holiday Box’ at the same time it is being released to subscribers. This gourmet box will arrive at your home beautifully wrapped in an aquamarine box with a red ribbon, and will include 8 culinary specialties (instead of the usual 7) from a variety of countries. Think gingersnaps from Sweden, açaí dessert sauce from Brazil and mini-Panettone from Italy. To be eligible to receive the Try The World Special Edition Gourmet Holiday Box, leave a comment below by November 10th naming the country whose cuisine you favor above all others. One lucky winner will be randomly selected to receive the gift box and announced here on November 12th 2015. Limited to U.S. addresses only. Disclosure: The sponsor sent me a holiday box to write this review and is sponsoring the reader giveaway. I tend to enjoy treats and food from Japan. France would be hard to beat, so many regions, so many different styles of food! It’s hard to narrow down my favorite cuisine. I’d include Mediterranean/Greek and French among them but would be happy with several others! So hard to choose! I guess I would have to go with either Indian or Italian. All regions of those countries have something different and delicious to offer! So far I have enjoyed the cuisine from every country I have visited! But if I have to pick just one, I would chose Italy. Thanks for letting me know about Try The World! For my wife’s 65th and my70th ,we love the Mediteranean Food Of Santorini,Greece,healthy, delicious,attractive, satisfying and foodatricious.Lorenzo Of CT.
Italy was my grandmother’s kitchen…I loved it! Thomas Jefferson wrote that travel makes men wiser but less satisfied when they return home. That is my sentiment when it comes to food. My husband and I were very fortunate to be invited to join good friends in a private home in Forte dei Marmi, Italy. We experienced it all from shopping in local stores and cooking in a large basement kitchen, dining in restaurants, entertained in private homes of their friends who taught us the particulars of pesto and secrets of boiling the pasta with potatoes. Then we traveled and ate with them throughout several regions of this beautiful Country and some famous locations. They love Italy and had spent time there before and return as often as possible. Some of the best meals were in the most unusual scenarios like being in the mountains during siesta time and dining on freshly made polenta with mushrooms. Good food is like good friends – one can never get enough. What a great way to experience world cultures without having to fly there. Part of why I enjoy the food festival at Disney’s Epcot is getting to try all different cuisines from around the globe. I would say German, Greek, Moroccan, and Japanese are my top favorite kinds of food–I don’t think I’d be able to pick just one out of those four. My favorite country’s cuisine is by far Italy. I just love the taste of roasted tomatoes, garlic, pesto, and olive oil! The cheese they make is divine! Slap all that on bread and I am in heaven. I strongly believe that bread is heaven on earth. I love the cuisine of Spain! It’s not the country of origin that makes food great, it’s the person who makes it. That said, I’ll never say no to French pastry, Mexican fruit, or New Zealand chocolate. I haven’t been to Italy, but my friend next door is from Italy and I have enjoyed her fabulous authentic cooking on many occasions. My favorite foods are definitely from Germany! I lived there for 6 months during my study abroad and am definitely feeling a bit homesick for the foods I had there. My all time favorite cuisine is from India! Paneer and Naan and curry!